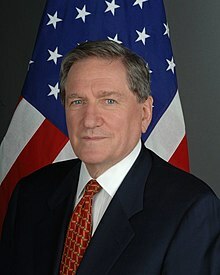 Richard Charles Albert Holbrooke (April 24, 1941 - December 13, 2010) was an American diplomat. He became well-known when he helped broker the Dayton peace agreement, together with Carl Bildt. This agreement of 1995 helped end the war in Bosnia-Herzegovina. He died of a torn aorta on December 13, 2010. He attended Scarsdale High School, before going to Brown University and the Princeton University. ↑ 1.0 1.1 1.2 "Strong American Voice in Diplomacy and Crisis". Robert D. McFadden. The New York Times. December 13, 2010. Retrieved August 9, 2017. This page was last changed on 31 August 2017, at 10:43.